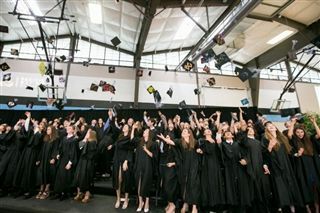 The 82 members of the Class of 2015, along with many family members and friends, enjoyed a joyful commencement ceremony on June 11th. After an introduction by Upper School co-heads Allegra Molineaux and Tim Betzala, Senior Class President Michelle Levitt and Student Body Vice President Kayla Causey warmly recalled experiences from the class's six years at the school. Student Body President Christian Potter thanked faculty members for their commitment and compassion, before introducing Head of School Dr. Bob Ogle, who applauded the seniors' remarkable ability to commit themselves fully and joyfully to whatever they do. A heartfelt and amusing video message from faculty and a performance of "Home" by senior musicians preceded the presentation of diplomas and reading of the class's senior statement. The ceremony concluded with the graduation chorus performing "Blessings," and the traditional tossing of mortarboards. Congratulations, graduates!